Google Cloud introduced Anthos, a new open platform form managing applications, unmodified, on existing on-prem hardware or in public clouds, including third-party clouds like AWS and Azure. Anthos, which is the new name for the Cloud Services Platform that Google announced last year, is generally available both on Google Cloud Platform (GCP) with Google Kubernetes Engine (GKE) and for private data centers with GKE On-Prem. Anthos Config Management creates multi-cluster policies that set and enforce role-based access controls, resource quotas, and namespaces—all from a single source of truth. Anthos leverages open APIs and is based on GKE, Google's managed Kubernetes service. Anthos launches with more than 30 hardware, software and system integration partners. Cisco promises integrations between Anthos and its own data center, networking, and security technologies, including Cisco HyperFlex, Cisco ACI, and Cisco Stealthwatch Cloud and Cisco SD-WAN. VMware, Dell EMC, HPE, Intel, and Lenovo have committed to delivering Anthos on their own hyperconverged infrastructure for their customers. Google Cloud is also introducing Anthos Migrate in beta, which auto-migrates VMs from on-premises, or other clouds, directly into containers in GKE. Google Cloud teams with partners for "Open Cloud"
Confluent: Founded by the team that built Apache Kafka, Confluent builds an event streaming platform that lets companies easily access data as real-time streams. DataStax: DataStax powers enterprises with its always-on, distributed cloud database built on Apache Cassandra and designed for hybrid cloud. Elastic: As the creators of the Elastic Stack, built on Elasticsearch, Elastic builds self-managed and SaaS offerings that make data usable in real time and at scale for search use cases, like logging, security, and analytics. InfluxData: InfluxData’s time series platform can instrument, observe, learn and automate any system, application and business process across a variety of use cases. InfluxDB (developed by InfluxData) is an open-source time series database optimized for fast, high-availability storage and retrieval of time series data in fields such as operations monitoring, application metrics, IoT sensor data, and real-time analytics. MongoDB: MongoDB is a modern, general-purpose database platform that brings software and data to developers and the applications they build, with a flexible model and control over data location. Neo4j: Neo4j is a native graph database platform specifically optimized to map, store, and traverse networks of highly connected data to reveal invisible contexts and hidden relationships. By analyzing data points and the connections between them, Neo4j powers real-time applications. Redis Labs: Redis Labs is the home of Redis, the world’s most popular in-memory database, and commercial provider of Redis Enterprise. It offers performance, reliability, and flexibility for personalization, machine learning, IoT, search, e-commerce, social, and metering solutions worldwide. Google Cloud announced plans to open new regions in Seoul, South Korea and Salt Lake City, Utah, bringing the total number of global regions to 23 in 2020. In three years, Google Cloud has opened 15 new regions and 45 zones across 13 countries. Seoul will be Google Cloud’s eighth region in Asia Pacific. Salt Lake City brings the total Google Cloud regions within the continental United States to six. "Google Cloud's expanding infrastructure in Salt Lake City is a welcome development as our growing business continues to scale to meet the needs of over 250 million customers,” said Dan Tournian, PayPal’s Vice President of Employee Technology & Experiences and Data Centers. “This new region will enable enhanced availability and performance for our customers, when every millisecond counts." CANAL+ has strategically chosen to base its new Content Delivery Network (CDN) on the Cisco NCS 5516 Series platform, using Cisco IOS XR software. The upgrade provides enhanced capacity to handle projected traffic growth driven by increasing content consumption. As the highest traffic peak recorded by CANAL+ last year was 500Gbps, the new CDN has been designed to deliver 1Tbps + on day one. It will be supported by twin POPs to deliver both live and on-demand content. The upgrade also protects CANAL+ critical services against any faults within the core and at the network edge. Iliad has selected Cisco for a national IP Network to support a new mobile offering in Italy. The network leverages Segment Routing IPv6 (SRv6). This new architecture is built upon multiple products spanning the Cisco networking portfolio, including the ASR 9000 and new NCS 5500 routers for core IP, NCS routers for DWDM infrastructure, and Nexus switches for Data Center. Cisco said the SRv6 deployment enables Iliad to build a network that is extremely scalable with improved reliability, flexibility and agility, all while helping to reduce CapEx and OpEx. To further expand the SRv6 benefits across the entire network, Iliad has developed, in close collaboration with Cisco, its own SRv6 software stack that will equip its homegrown “NodeBox” designed to aggregate the traffic from mobile base stations. At this week's MPLS+SDN+NFV World Congress in Paris, Huawei is introducing its NetEngine 8000 intelligent metro router series. The NetEngine 8000 is optimized for diversified services and massive connections required in the 5G and cloud era. It delivers one converged transport, ultra-large capacity, end-to-end SRv6, and full-lifecycle automation. Capacity: NetEngine 8000 series provides a capacity of 14.4T/slot - the highest density in the industry according to Huawei. It supports up to 36 x 400GE ports or 72 x 100GE ports. The compact design of the NetEngine 8000 offers powerful heat dissipation and efficient power supply and the converged platform with SR, PE, and DC-GW. New protocol stack: Support SRv6 for intelligent connectivity with the first commercial deployment. The NetEngine 8000 series offer the SRv6 capability, which can effectively cope with the massive connections, provides better user experience, and help operators achieve smooth evolution from MPLS to SRv6. SRv6 is based on native IPv6 and meets requirements of massive connections. SRv6 also provides the various expansion capabilities to implement automatic cross-domain connection and minute-level service provisioning, achieving one-click connect to cloud of service configurations, performing service awareness with the tenant/app level SLA assurance. New Way of Operation: Full lifecycle automation. The NetEngine 8000 series use Network Cloud Engine (NCE) to establish intelligent connections - a new O&M system with high availability to implement full-lifecycle automation. NCE + SRv6 can implement 50ms protection, minute-level traffic optimization, second-level fault identification, and minute-level fault locating for any topology. It significantly improve network availability and help operators expand their business in vertical industries in the 5G and cloud era. an Jose. This brings the total number of cities where AT&T 5G is active to 19. There are now 19 cities across the nation where AT&T is the only carrier to offer mobile 5G service to businesses and consumers, well ahead of our competition. AT&T also said it is on track to deliver mobile 5G over mmWave spectrum by early 2020, in addition to its coverage over “sub-6” spectrum. Equipment from Samsung Electronics Co. represents the largest share the recent 5G network rollouts from all three mobile operates in Korea. Korean operators have been transmitting 5G signals in Seoul and metropolitan areas since December 1, 2018 using 5G base station radios and 5G core solutions from Samsung’s Networks Business unit. Specifically, Samsung has supplied 5G core solutions and more than 53,000 5G radio base stations to Korea’s three operators. The deployments used Samsung’s 5G Massive-MIMO Unit (MMU) radio base station in the 3.5GHz spectrum. The ability to re-use existing sites has been key to enabling the Korean operators to deploy a 5G network consisting of tens of thousands of radios within just a few months since the December 1st launch. The virtualized 5G core solutions, provided to all three Korean operators for their 5G commercial launch, support both legacy 4G networks and next-generation 5G services in Non-Standalone (NSA) mode. Samsung will support the migration to Standalone (SA) mode through a future software upgrade. Samsung’s solution implements many of the key technologies of 5G networks, such as Control and User Plane Separation (CUPS), which are essential for network operators to scale their networks and support the new services enabled by 5G technology. Transaction Network Services (TNS) and Metaswitch introduced Call Guardian Authentication Hub, a new hosted STIR/SHAKEN solution that provides carriers with a call authentication solution. FCC Chairman Ajit Pai has challenged U.S. operators to adopt protocols that combat illegal spoofing and better protect subscribers from unwanted robocalls, or face regulatory action. Call Guardian Authentication Hub is a fully managed service that combines the TNS Call Guardian analytics and robocall detection solution used by leading U.S. wireless and landline service providers with Metaswitch’s STIR/SHAKEN compliant MetaSphere QCall solution, which enables signing and verifying Caller ID. Metaswitch was the first vendor to both complete successful implementation of a STIR/SHAKEN caller ID authentication solution in the ATIS robocalling testbed and deploy in production with a Tier 1 provider in North America. The Call Guardian Authentication Hub leverages TNS’ visibility into over 1 billion call events daily resulting from TNS’ connectivity with more than 500 North American carriers. While STIR/SHAKEN enables carriers to sign calls within their own network, the Call Guardian Authentication Hub simplifies signing of inter-carrier calls by automatically authenticating and verifying calls and applying the appropriate call validation treatment. It includes support for universal call blocking of illegal robocalls as defined by U.S. and Canadian regulators. While leading U.S. carriers are moving towards STIR/SHAKEN implementation, a majority of cross-carrier U.S. wireless voice traffic does not exclusively transit the networks of the largest carriers, allowing bad actor robocallers to simply continue originating traffic from Tier 2 and 3 carrier networks that do not deploy STIR/SHAKEN compliant solutions. At the same time, Canadian Telecommunications Service Providers (TSPs) have a requirement to implement authentication and verification of caller ID information for Internet Protocol (IP) voice calls to empower Canadians to better protect themselves against nuisance calls. An additional capability of this service allows operators to identify and apply treatment to spoofed calls that have traversed non-IP networks or do not have STIR/SHAKEN framework deployed. This multi-layered approach maximizes the effectiveness of the solution. 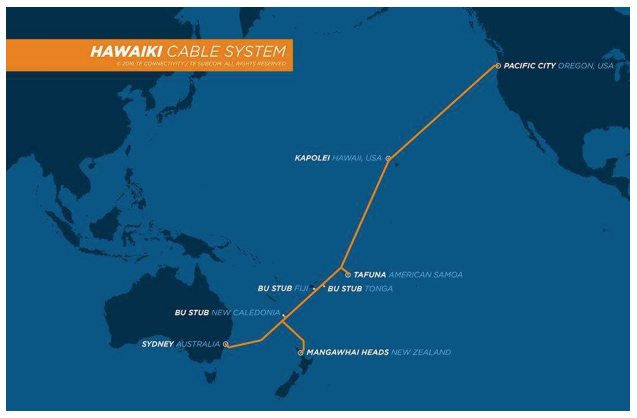 Hawaiki Submarine Cable LP has extended its U.S. presence from Hillsboro, OR to the Westin Building Exchange (WBX) carrier hotel and data center in Seattle,. The Hawaiki transpacific cable is a 15,000 km fiber optic deep-sea, carrier-neutral cable with a design capacity of 67 Tbps. Hawaiki went live in July 2018. NETSCOUT SYSTEMS announced preliminary financial results for its fourth quarter and fiscal year ended March 31, 2019 below previous guidance. The company now expects 4Q FY2019 revenue to be approximately $15 million lower than originally anticipated, primarily due to delayed revenue recognition on a large service assurance project at an international mobile operator. However, NETSCOUT anticipates a solid quarterly GAAP and non-GAAP EPS performance due to healthy gross margins resulting from a more favorable product mix and lower operating costs. Singhal concluded, “As we move forward, we believe that the most severe headwinds impacting our revenue performance in recent years have largely subsided, and we remain focused on executing key elements of our strategy that we believe are integral to driving improved, sustainable financial performance. Our plans for fiscal year 2020 anticipate both organic top-line growth and EPS growth. We will share more insight when we report our full-year fiscal year 2019 results next month.